AF series contactors are provided in either three or four power pole configurations with a variety of accessories including auxiliary contacts, close coupling adaptors, interlocks, and busbars. AF series contactor coils are designed to utilize both AC (50/60 Hz) and DC control circuit inputs ranging from 12 to 500V. Surge suppression is included. 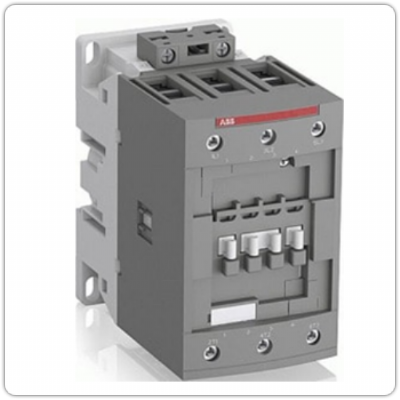 AF 12 contactors are used for controlling power circuits up to 690 V AC and 220 V DC. They are mainly used for controlling 3-phase motors, non-inductive or slightly inductive loads. AF… contactors include an electronic coil interface accepting a wide control voltage Uc min. … Uc max. Only four coils cover control voltages between 24…500 V 50/60 Hz. AF contactors can manage large control voltage variations. One coil can be used for different control voltages used worldwide without any coil change. AF contactors have built-in surge protection and do not require additional surge suppressors. The AF… series 1-stack 3-pole contactors are of the block type design. – Main poles and auxiliary contact blocks: 3 main poles, 1 built-in auxiliary contact, front and side-mounted add-on auxiliary contact blocks (mechanically-linked auxiliary contacts compliant with Annex L of IEC 60947-5-1. N.C. mirror contacts compliant with Annex F of IEC 60947-4-1) – Control circuit: AC operated – Accessories: a wide range of accessories is available. Featuring AF technology as standard, the complete range of ABB’s AF contactors establishes a new industry benchmark. The electronically controlled coil offers multiple benefits over conventional alternatives, and together with ABB’s wide product offering – an optimal configuration, every time. The AF contactor secures your uptime, gives you global support, optimizes your logistics and simplifies your design. The AF contactor ensures distinct operation in unstable networks and signifies a major advance in motor control and power switching. The contactor and motor protection range from ABB is designed in compliance with all major national and international standards and is available worldwide via a global distribution network. The total number of product variants has been reduced by up to 90%.